Garage doors can be dangerous if not properly maintained. This is why we always recommend professional maintenance checks of your system. Our local technicians will not only inspect each of one of your system's components, they'll also make sure that your door is operating safely. Read on to learn why it's essential to check and repair minor door issues as they occur, rather than wait for them to evolve into larger problems. Our team will ensure that your door functions safely and effectively for as long as possible. Your door needs good balance for it to move effectively up and down the tracks. An unbalanced door is an indication of a spring-related problem. If this happens, the door may not close evenly, leaving a gap. Even a small gap can be an invitation for unwanted visitors, human or animal, to invade your home. As springs can be hazardous to handle, we recommend you contact our team to check the tension of your springs and make adjustments as necessary. We'll also check the overall alignment and balance of your system which could be due to other reasons like a dented track. Springs counterbalance the weight of the garage door, and are also responsible for the heavy lifting during the opening and closing cycle. These components are regularly placed under enormous pressure so it's natural that they're subject to wear and tear. To keep your springs in good condition for longer, the tension will need regular checking and lubricant will need to be applied to protect against and tackle any rust. 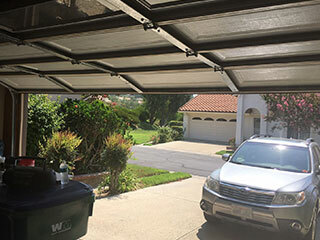 During a preventative garage door maintenance session, we will examine your garage door's safety reversal system. Your opener's set of photo-electric eyes are supposed to detect any obstacles in your door's path. If the door does not reverse when there is an obstacle in the way, the sensors may need to be appropriately cleaned or realigned. Don’t delay - make a garage door maintenance appointment with our experts at Garage Door Repair Merrick. Our technicians will make sure your overhead door is well maintained and endeavour to stop any issues early in their tracks. Get in touch today!